Have you noticed a change to our Archives Search and Image Search? 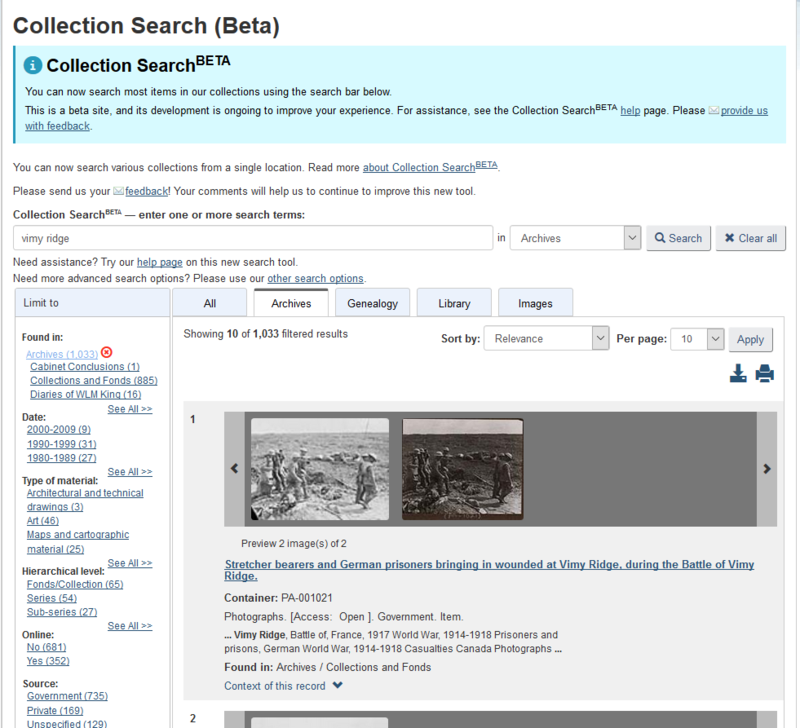 We have started making changes to our Archives Search and Image Search to improve users’ online experience. This will enable you to get more reliable, timely, pertinent, consistent and accurate results. Search results will remain the same though they may be ordered differently. The new Image Search will display results in a more user-friendly way. The new main Archives Search results page will provide an easier and a more efficient way to view digitized textual records, eliminating the need for extra searches and viewing via Image Search. Is there information that you cannot find with the new Archives Search and Image Search? Have you come across any broken links? Help us improve the Archives Search and Image Search by submitting your comments, suggestions or ideas online. Our experts would like to add some clarifications to our earlier post: Lights, Camera, Action! Searching for Film, Video and Sound recordings. Some published audiovisual material, such as feature films, can be found through the Film, Video and Sound Recordings database. Some can be found in Library Search. It is therefore recommended that you search both. Fonds and accession records of items searchable on the Film, Video and Sound link can also be found using Archives Search. If you’re looking for information about audiovisual recordings in the archival collection of Library and Archives Canada, use our Film, Video and Sound database, which contains details on individual audiovisual recordings that cannot be found in our Archives Search. If you are looking for published audiovisual recordings, such as commercial film or television production, use Library Search. It is not yet possible to view the recordings online. Please see our blog post on How to Consult Material that IS Not Yet Available Online for details. In the Film, Video and Sound database, the statement No consultation copies available indicates that a consultation copy must be made before you can consult or order a copy of the document. This will take approximately six weeks. *Please consult our clarification regarding this article. From the Type of material drop-down menu, select Photographic material and then Submit. Your search will generate a list of results. Select the underlined titles to access the full description of a photograph. Descriptive records display images of photographs that have been digitized. Keywords: Try various spellings, synonyms, and French equivalents. Online images: Find photographs with digitized images online by selecting Yes from the Online drop-down menu in the Archives Search screen. Search Help: Visit Framing Canada: A Photographic Memory—Search Help for more information about searching LAC photos. Our Photography section offers a vast selection of tools and resources to help you discover the LAC photographic collection. A reader from France is asking if he can copy photographs found on LAC website or its Flickr account for a commemorative exhibit on November 11th. He also mentions that he has done research on 3 Canadian soldiers (Kenneth Douglas Stephenson, Fred Plummer and James Archibald Marshall) who died in 1918 and are all buried in the cemetery of La Sentinelle, a locality of the north of France.